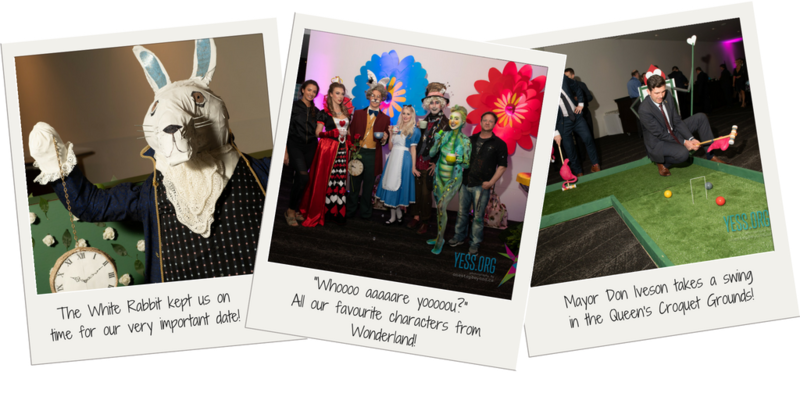 On April 27, we invited YESS Gala guests down the rabbit hole into a land of fantastical whimsy… Wonderland! Guests arrived at the Shaw Conference Centre and entered the lush gardens of our heroine Alice’s imagination. We mingled with the White Rabbit, the Mad Hatter, the Caterpillar, the Queen of Hearts, and Alice herself, brought to life by the wonderful cast from Rhythm FX. There was an abundance of hors d’oeuvres from the garden including carrots on a bed of spices, roasted mushrooms, and potato churros. For the brave, there was also a chance to take on the Queen of Hearts at her favourite game: croquet! Inside the hall was an enchanted forest filled with treasures: our silent and live auction items, a raffle for 100 bottles of wine generously provided by the Sherlock Holmes Hospitality Group, and another raffle for a 2-karat diamond ring and a “pay it forward” pendant piece to be gifted to a YESS youth provided by Paris Jewellers. When gala MC Ryan Jespersen took the stage, he wasn’t alone. He was joined by the one and only Cheshire Cat, who of course had more riddles than answers for our guests! Ryan and Cheshire invited Mayor Don Iveson and Honourary YESS Patron Sarah Chan to the stage. Sarah talked about harnessing the potential of all youth in Edmonton, and Mayor Iveson spoke to the commitment of front-line workers in organizations across Edmonton and how they make our city’s goal to end homelessness possible. Cheers to that! 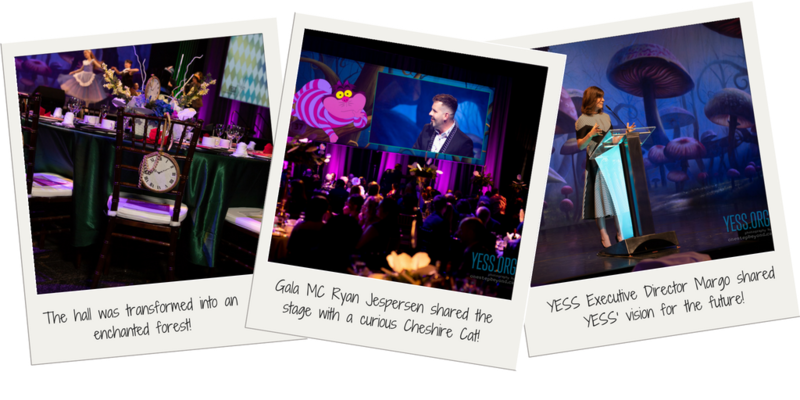 YESS Executive Director Margo Long had exciting news for her first YESS Gala: a new vision for YESS. We recognize that our goals and promises must align to make sure we are doing our best work in empowering our youth and working with other youth-serving agencies. Our vision is to walk beside traumatized youth on their journey towards healing and appropriate community integration. How will we do that? Special guest speaker Denise Ogden took the stage to share her story. “It takes a village, a community, caring people to support families through crisis. I know this firsthand when I became homeless at 16. “So let me provide some context. I’m 1 in 5. Meaning ….I live with a mental illness called depression. As Denise struggled with her feelings, she developed an eating disorder and began cutting herself. She attempted suicide. She was in crisis, and as her parents and sister watched without any idea what to do, they were in crisis, too. “A psychiatrist told my family I was just a sad little girl. Really not the answer you want to hear when English is your second language and you don’t know how to help your daughter, your sister, and you don’t know how to keep her alive. The staff at YESS provided Denise with the support she desperately needed. They also reached out to her parents and walked them through the pain and confusion they were experiencing. YESS staff mediated conversations that needed to be had, and within a month, Denise was back at home with her family. “It takes a village, a community, a group of people who care to walk with families and our youth. We are so grateful to Denise for sharing her story. Our guests were touched by her experiences and her testament to the power of supporting youth. 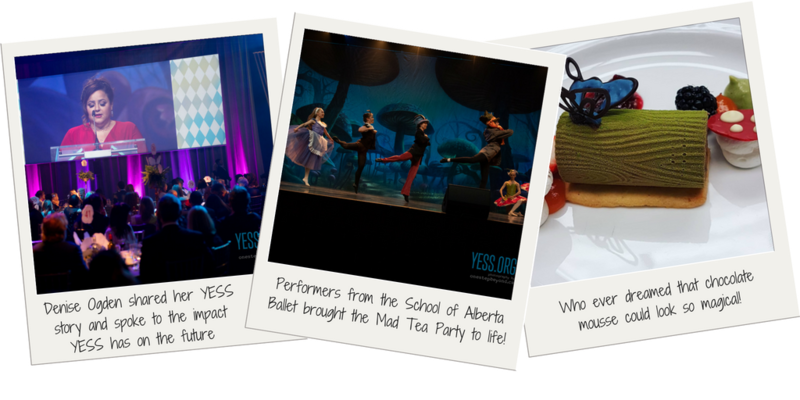 As dinner was served, dancers from the School of Alberta Ballet took the stage to perform “Tea Party” and “Roses” from the Alice in Wonderland ballet. These young performers were amazing and certainly brought the famously zany tea party to life! Throughout the evening, guests were able to peruse the many enticing items on offer in the silent auction. This year guests could also contribute to “Give a Dream” experiences for youth like a robotics experience at the TELUS World of Science or a shopping and adventure experience at West Edmonton Mall. As guests prepared to take their first bites of dessert, the cast of Wonderland characters serenaded everyone in the hall with a round of “A Very Merry Un-Birthday”! The dessert itself deserved it own round of applause for presentation. Thanks so much to Executive Chef Serge Belair and the entire culinary team at the Shaw for creating a delectable 3-course dinner for our guests. 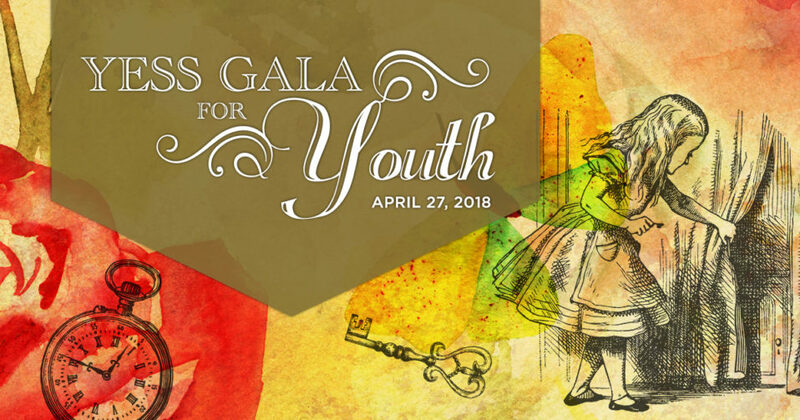 Thank you so much to all of the guests, sponsors, donors, performers, and volunteers who brought Wonderland to life at our YESS Gala for Youth! We are so excited to share that this year’s event raised $195,205. We are so grateful for your support as we walk beside traumatized youth on their journey towards healing and appropriate community integration. It was a great night glad i could be there 🙂 can’t wait for the next event!!!! !